When you read any received messages on WhatsApp two blue sticks shown on sender WhatsApp account. That means his messages is read by receiver on his WhatsApp account. Sometime you need to hide blue ticks and last seen of WhatsApp account. In that situation lot of person have to turn off read receipts or turn off last seen feature from Privacy option of his WhatsApp number. If you turn off read receipts, you won’t be able to see read receipts from other persons. If you don’t want to turn off read receipts feature and also want to hide blue ticks and last seen of WhatsApp number then you have to read this guide. Recently Whats introduced latest features for his users to get more flexibility to control and run his account. In this article you have to use help of Unseen-No Last Seen third party app on your Smartphone. If you don’t want others to know that you are reading his message then Unseen-No Last seen third party app is suitable for your. This app not only works for WhatsApp but also works for Facebook messenger, Viber, Telegram also. When any message received at your WhatsApp account and as you open the message it shows double blue stick at sender WhatsApp account. But sometime we don’t want that anyone can check that his message is read by the receiver on WhatsApp. In that situation you have to take help of Unseen-No Last seen third party app. This app not only hide the receipt notification but also hide the last seen. As you receive a new message on WhatsApp, Facebook messenger, Viber, Telegram you will get an notification at this app. You can read the received message from this app when you want, without having any kind of intimation to your friends. 1. Hide blue double ticks from WhatsApp. No last seen for Facebook messenger and no last read for Viber. 2. Read the chat messages invisibly without knowing your friends. 3. View WhatsApp videos, photos and audio files without leaving the double blue check sign. 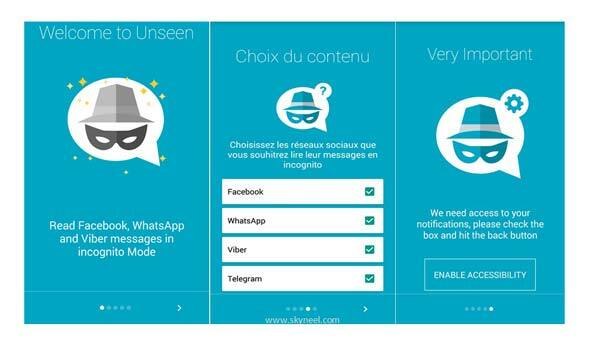 Step 1: Download and install Unseen-No Last seen third party app from Google Play Store. Must Read: WhatsApp How to count the number of messages sent to a person ? Step 2: Open the Unseen-No Last seen app at your device. Step 3: Now you will get an welcome to unseen window tap on the next button. Again press Next button till finish the welcome screen window. Step 4: Turn on enable accessibility button and turn on Unseen option at your smartphone. Click on the OK button to give your final confirmation. After finish the process you can check all incoming messages, videos, audio clips, photos from this app. I hope this guide is useful for all those guys who want to hide blue ticks and last seen of WhatsApp at his smartphone. If you feel we have missed out an point then please write us your suggestion in the comment box. Thanks to all.